Living downtown Toronto, I tend to walk everywhere I go. Whether it’s to meet up with a friend or simply home from work, there is something incredibly satisfying about putting on your favourite playlist and walking it out. So naturally, my sneaker collection has grown significantly since making the move back to the city. One of the newest (and most worn) additions to my collection is The Rbutus by SKYE Footwear, a new Canadian footwear company. And while I could never go as far as to consider myself a ‘sneaker-head’, being one of the first to experience SKYE Footwear has got me feeling hella hyphy. 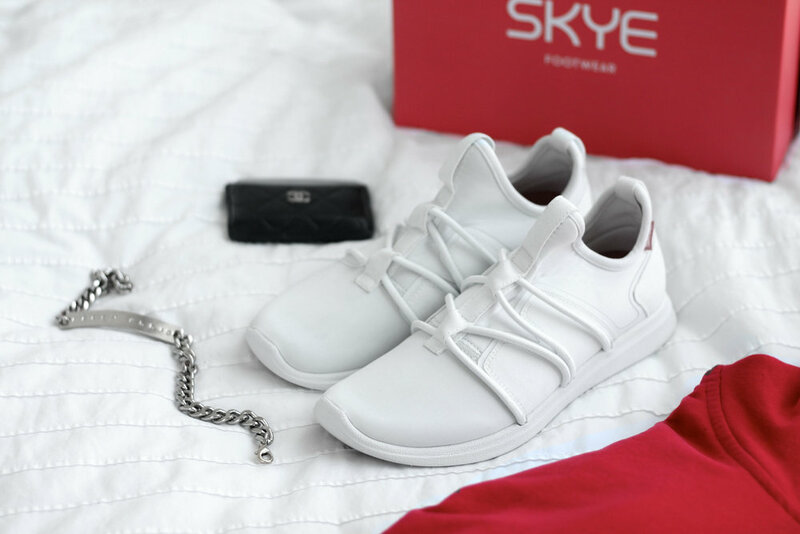 And while I'd never consider myself a ‘sneaker-head’ or ‘hypebae’, being one of the first to experience SKYE Footwear is giving me all the feels. Hailing from glorious Vancouver, BC, it’s no wonder SKYE Footwear puts a precedent on creating comfortable and sustainable footwear. Each style is ‘designed to be minimum-use, made animal-free, and every effort is made to be biodegradable and recyclable.’ From the packaging to the shoes themselves, SKYE Footwear uses man-made materials that offer a lower carbon impact than natural materials. But, personally, their true point of difference is the fact that each one of their styles offer a street-style edge, not typically found in a walking shoe. Of the three styles available from SKYE Footwear, I fell for The Rbutus, which remind me of a pair of Nike Roshe’s thanks to their tight fit and minimal detail. Available in two monochromatic styles, white and black, The Rbutus has become a go-to thanks to its lightweight, lace-less design. Instead of laces, they feature the stylish ‘ Loop Lok’, a roping system, inspired by West Coast water sports like stand-up paddle-boarding to keep shoes secure. Paired with their 4-way stretch man-made upper, The Rbutus remains easy to slide on but also offers a secure fit. For comfort, all styles feature a Foam Outsole and SKYE Footwear’s Impact & Rebound Insole, providing a gel-bed for your feet. This makes The Rbutus incredibly comfortable for running errands around the city and helps to prevent sore feet and knees at the end of a long day. Plus, I love the fact that both the insole and outsole are 100% biodegradable, meaning they are completely recyclable. Although, thanks to their durability, I doubt I’ll need a new pair anytime soon. When it comes to size, The Rbutus are true to size and fit like any other Nike or Puma sneakers I own. But unlike the other sneakers I own, this is one pair I’ll be reaching for day in and day out thanks to their lace-less design. If you’re digging this style, be sure to check out SKYE Footwear, and use my code: BrattyBSKYE for 15% off your purchase until Sept 30th, 2017. Shop here. What do you think of The Rbutus by SKYE Footwear? Let me know if the comment section below!